NOTE - adding metrics to the balanced profile can impact the sizing and performance of your vC Ops vApp. Be very conservative with the metrics you add and only add them as required. As always, I highly recommend you consult VMware support directly before making any changes to your vC Ops vApp. 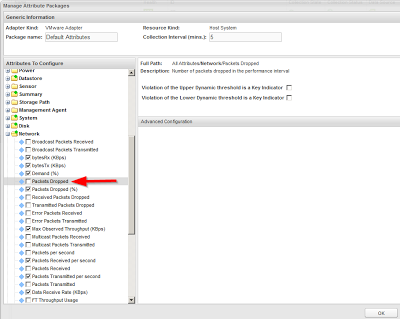 Beginning with version 5.7, you can choose to have the vApp collect a subset of the vCenter metrics with vC Ops. This is about a 50% reduction in the amount of metrics collected and has a few benefits. You must enable this, as it is not turned on by default, through the Admin UI. Screen shot below shows how. **UPDATE** as of version 5.8 the "Balanced Profile" is the default setting. So, in this case, the metric we need to add is "Network:Aggregate of all Instances | Dropped Packets" to get the heat map coloration working. It is possible to add metrics to the balanced profile, but it requires access to the Custom UI. So, you need to be running Advanced or Enterprise for this capability. Log into the Custom UI, go to Environment > Configuration > Attribute Packages. 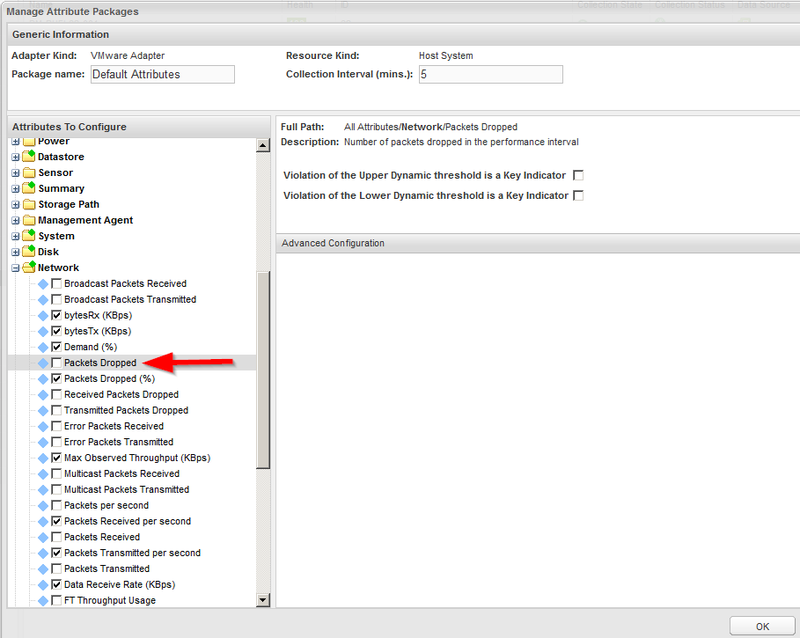 From there, pull down the VMware adapter kind and then the resource kind for which you need to add the metric. In our case, this is Host System. You will see two Attribute Packages - Default Attributes and All Attributes. Now, edit the Default Attributes (just select it and click the pencil icon). Again, we need to add a specific metric to get our heat map in working order, so browsing to the network group I will select Dropped Packets. As you can see in the screen cap below it is not on by default with the balanced profile (aka Default Attributes). Click the OK button to save. That's it!